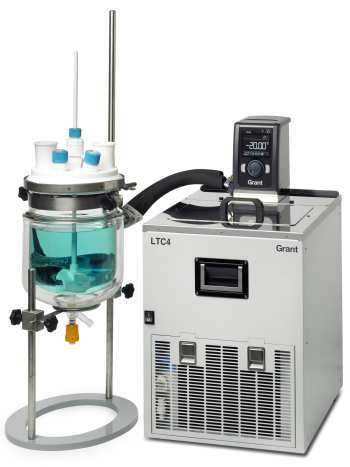 The Grant LTC4 provides outstanding performance for routine and sophisticated applications requiring accurate temperature control in the range of -30 to 100°C. The LTC4 includes the TX150 heating circulator and an R4 tank/refrigeration unit, complete with insulated tubing and clips to form a system ready to use. The TX150 Optima™ is high-performance programmable digital heating circulator with an exceptionally simple user interface. This allows fast set-up of multiple parameters through a powerful menu system and provides sophisticated control for temperature-controlled applications. USB connectivity is available to a PC or laptop. It is programmable with Labwise™, a software program to set all parameters, including programs, via the PC. Labwise™ also features real-time status windows, a graphic display of the controller's performance as a program is run, and allows data to be logged for future recall and analysis. Note: The refrigeration unit can be switched off independently of the circulator to allow heating only applications. All the refrigeration base units can be used up to a maximum temperature of 100°C.